Melody Owen is an artist and graduate student in the MA in Environmental Arts in Humanities (2015-2018). Before coming to OSU, she completed a MFA in Electronic Integrated Art from Alfred University and a BA in Photography from University of Oregon. She has done artist residencies all over the world including the Cité Internationale des Arts (Paris, France), the Gil Society (Akureyri, Iceland), the Est-Nord-Est Residency (Saint-Jean-Port-Joli, Canada), and Gaestatelier Krone (Aarau, Switzerland). 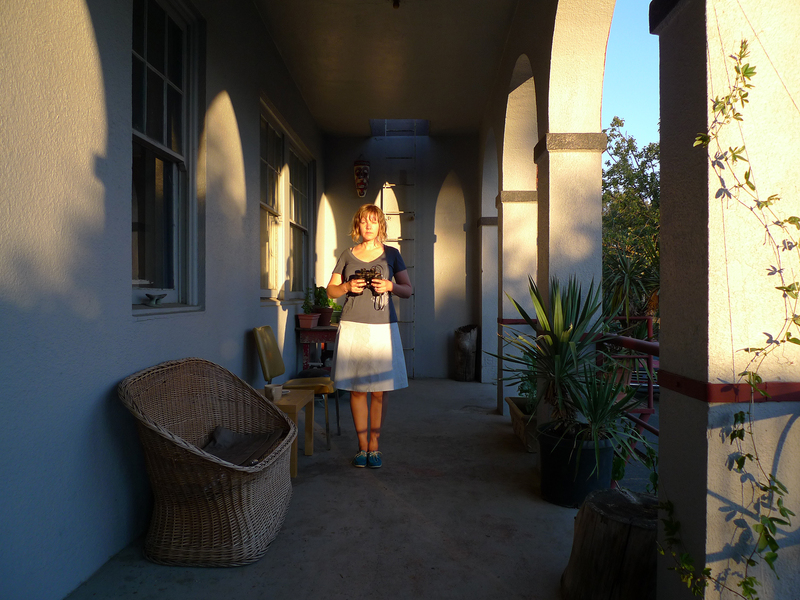 Since starting her MA in Environmental Arts and Humanities, she has also done residencies at Playa (Summer Lake, Oregon) and Djerassi (Santa Cruz Mountains, California). Melody has shown her work at the Royal College of Art (London, England), Clough-Hanson Gallery at Rhodes College (Memphis, TN), Spoonbill and Sugartown (Brooklyn, NY), Bellevue Art Museum (Bellevue, WA), the Art Gym at Marylhurst University (Marylhurst, OR) and the Portland Art Museum (Portland, OR). Her books have been published by Publication Studio, Future Tense, Scout Books and Container Corps. Carly Lettero, Environmental Arts and Humanities Program Manager, asked Melody about her art and her experience in the MA program in November, 2017. Your work invites people to think about animals—their languages, their lives in the wild and in captivity, their bodies, their threatened habitats, their connections to humans. What is it about animals that captures your creative and moral imagination? I have always felt a strong connection to animals. I decided to become a vegetarian very early, around the age of six or seven. To me, animals were friends, not food. I knew it then and I know it now. I know it by looking into an animal’s eyes. I know it when I go to a zoo or when I hold a cat, or even look at a fish in a tank. There is someone in there. They are like me in a way but also vastly unlike me. We all have skin and bones and organs and eyes. We all breathe, and walk (or swim), and think. We are all remembering, playing, laughing, working, protecting, singing, feeling joy, feeling pain, feeling fear. We are just doing it in different ways. What I wanted to study (though I didn’t yet realize it even had a name) was primarily Jakob von Uexküll’s concept of the umwelt (unique bubbles of perception experienced by every living being) and also facets of post humanism that explore the philosophical and psychological boundaries between us and other animals. I have always wondered about the idea of the animal’s experience as it is informed by the body they inhabit, so it is exciting to learn about this way of framing it. I have also always been interested in animal language. I previously have made work around that issue. A real disconnect exists between the inherent worth of animals and the way we treat them. I am very concerned about the mass extinction that is happening. These amazing beings (who often predated us on earth by thousands or millions of years) are vanishing, one by one. I am also extremely disturbed by factory farming and the mass die off of bees, butterflies and birds due to pesticides. Also, I am concerned about habitat loss, plastic pollution, ocean acidification and sound pollution. And, of course, climate change. I wanted to know more about these things and work on how to encourage humans to remember that they are animals too and that we need to change the way we are treating the planet and all its inhabitants, including us. You have worked with so many mediums including installation, video, collage, sculpture, and books. And you have collaborated with people who have all kinds of expertise—glass and digital artists, writers and publishers, environmental scientist and researchers. When you have an idea for a project, how do you approach it and decide what mediums you want to work in and who you might collaborate with? I like to blur the boundaries between mediums. I like to try new ways of saying things. It often seems like the idea has me, rather than the other way around. I let the idea dictate the direction, medium, material… Sometimes an invitation or location will spark the idea, but then it seems to unroll on its own. I know it is coming from inside me but I often feel more like a guide, helping the idea to realize itself. There have been times when I have not listened closely enough to what the idea wanted to be and then it didn’t work. They usually need careful paying attention to when they are forming, it’s like hatching baby dragons. This also goes for the people I work with, I often am guided right to them (somehow) by the idea itself. I recently met a woman getting her PHD in marine acoustics. It just so happens that she works with humpback whale song and has generously provided me with sound recordings that I can use in my thesis work. That is a good example of the kinds of miracles that can happen when you put your mind and attention on a thing and stay open to possibilities. Before coming to OSU, you had already completed an MFA in Electronic Integrated Art from Alfred University and a BA in Photography from University of Oregon. Why did you decide to pursue a master’s degree in Environmental Arts and Humanities? Midway through my first masters, I met a beluga whale at the Shedd Aquarium in Chicago while driving across the country. She looked at me and playfully sprayed me with water and I felt a kind of communication happen across our species divide. There was something about this experience which shifted me from interested in animals to committed. It was a life changing meeting. I knew at once that I wanted to help them. There was no environmental teaching at that school but I listened to a lot of environmentally oriented podcasts (Living on Earth for example) and as I learned more about what is going on, the more concerned I became. Immediately upon graduating, I started looking for a way to study animal issues via art and writing. I wanted to do animal studies but I was looking for a program that was interdisciplinary and in which I could concentrate on both animals and art. Not environmental science exactly and not biology. I didn’t know how but I wanted to find a way of framing environmental issues through the language I already knew which is the arts. So, I was pretty amazed when it turned out that such a program (EAH) was forming just down I5 a bit. The Environmental Arts and Humanities program works at the intersection of arts, humanities, and environmental science. How has this interdisciplinary approach informed your art? I have always worked across disciplines but never in the humanities and never in such an academic way. This has primarily given me a new way to frame and understand issues. I was exposed to a huge amount of environmental information in my first year here which I am still sorting and processing. I have become more confident about making political work. Within the arts community, this is sometimes discouraged (depending on who you are talking to). I want this interdisciplinary environmental approach to grow because I think it is the best hope for our planet. People with different kinds of minds and backgrounds getting together have a better shot at thinking outside the box and solving problems. Our current box is not working out. What connections have you made at OSU that you imagine carrying forward into the next phase of your career after you graduate? It is always great to learn from and collaborate with people working in different disciplines. Here, I have met a lot of different kinds of people who are really concentrated on environmentalism and it is such a relief! It is gratifying to work with others who share your concerns and want to dedicate themselves to changing things. I have met artists, scientists, historians, writers, musicians… I am definitely forging productive relationships that I hope will last. What advice do you have for artists who are considering applying to this program? I would say that this is a great program for practicing artists to learn about different aspects of environmentalism through the humanities, which can then be expressed through their own work. On the other hand, if you are wanting to go to “art school” and learn about art history, theory or practice, then this is not yet the right school for you. Very few graduate art classes are offered here since there is no MFA program. I already have an MFA and also am interdisciplinary in my practice so I have been able to take classes in different mediums. I am learning how to navigate within the humanities, but I will be doing my thesis as an exhibition and series of self-published journals. I hope that at some point the art program here will expand into an MFA program and more environmentally active artists will be added to the faculty. Melody’s committee in the Environmental Arts and Humanities program includes Amanda Tasse, Anita Guerrini, and Julia Bradshaw. Environmental Arts and Humanities student Melody Owen blends disciplines and mediums to create art about animals.